One might assume the skeptical cardiologist has a quick and accurate answer to this question given that he has spent a very large amount of his career either researching, teaching or interpreting echocardiograms. Surprisingly, however, it turns out to be extremely difficult to come up with a good response. An echocardiogram is an ultrasound test that tells us very precisely what is going on with the heart muscle and valves. I’ve written previously here and here on how important they are in cardiology, and how they can be botched. As in the example of a severely leaking aortic valve below, we get information on the structure of the heart (in grey scale) and on blood flow (color Doppler). This type of information is invaluable in assessing cardiac patients. In the last week I’ve had 2 patients call the office indicating that even with insurance coverage, their out of pocket costs for an echocardiogram were unacceptably high – almost a thousand dollars. A small, handheld ultrasound machine that performs the basics of echocardiography can now be purchased for 5 to 10K. More sophisticated systems with more elaborate capabilities cost up to 200K. In my echo lab the machines are typically replaced about every 5 years, but in smaller, more cost sensitive labs they can be used for decades. An echo test typically takes up to an hour, and a sonographer performs up to 8-10 tests per day. At facilities trying to maximize profit, tests are shortened and sonographers might perform 20 per day. In the U.S., echos are performed by sonographers who have trained for several years (specifically in the field of ultrasound evaluation of the heart) and earn on average around 30$ per hour, however, Medicare and third party payors usually don’t require any sonographer certification for echo reimbursement. Physicians who read echocardiograms vary from having rudimentary training to having spent years of extra training in echocardiography, and gaining board certification documenting their expertise. Interpretation of a normal echocardiogram takes less than 10 minutes, whereas a complicated valvular or congenital examination requiring comparison to previous studies, review of clinical records and other imaging modalities, could take more than an hour. Given these wide parameters, estimating what one should charge for the technical or physician portions of the average echo is challenging. Len Charlap, a retired math professor, has had two outpatient echocardiograms in the past three years that scanned the valves of his heart. The first, performed by a technician at a community hospital near his home here in central New Jersey, lasted less than 30 minutes. The next, at a premier academic medical center in Boston, took three times as long and involved a cardiologist. This graph shows the marked variation across the US in price of an echo. In all the examples, however, what the hospitals were paid was around 400$ which is the amount that CMS pays for the complete echo CPT code 93306. At the Primus Super Specialty Hospital in New Delhi, India, apparently you can get an echocardiogram for $50. At one private UK clinic, you can have your echo read by Dr. Antoinette Kenny, who appears extremely well qualified for the task. Whereas I would not be interested in getting an echo done in India or Mexico, I would definitely have one done in Dr. Kenny’s center if I lived nearby. My hospital, like most, will write off the costs of an echo for indigent patients. I will read the tests on such patients pro bono (although doctors never use that term because we feel it makes us sound to lawyeresque). The hospital also has a price it charges for those patients who are not indigent, but who have excessively high deductibles or co-pays with their insurance. In some cases this “self-pay” charge is significantly less than what the patient would pay with their insurance. Paying out of the pocket for the echocardiogram may also make sense if the patient and/or physician really thinks the test is warranted, but the patient’s insurance deems it unncessary. If you find yourself in a situation where a needed echocardiogram performed at your ordering doctor’s preferred facility is prohibitively high, it makes sense to look around for a more affordable option. However, I must advise readers to be very cautious. 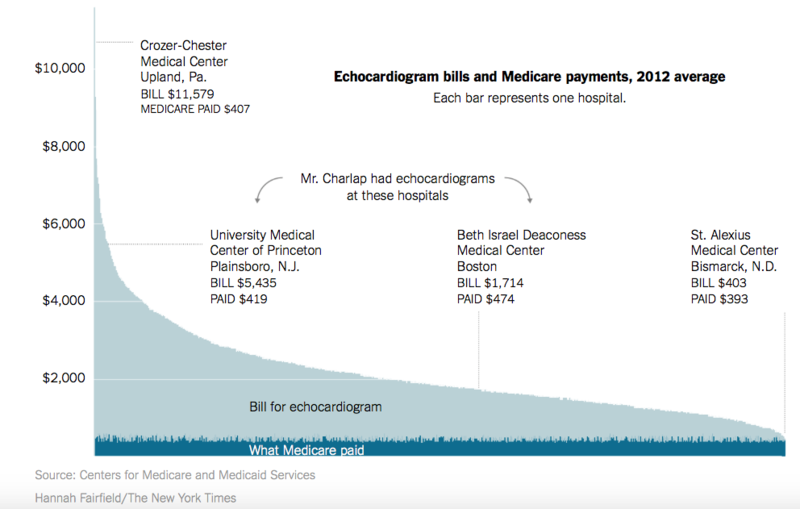 In the NY Times example, the hospital charges for Mr. Charlap seemed inversely proportional to the quality of the echo he received. This is not necessarily the case for a self pay echo. It is more likely that a cheap upfront out-of-pocket cost quote in a doctor’s office or a screening company reflects cheap equipment with minimal commitment to quality and brevity of exam and interpretation time. I have encountered numerous examples of this in my own practice. One of my patients who has undergone surgical repair of her mitral valve decided to get an echocardiogram as part of a LifeLine screening (see here and here for all the downsides of such screenings). The report failed to note that my patient had a bicuspid aortic valve and an enlarged thoracic aorta. These are extremely significant findings with potentially life threatening implications if missed. If a high quality echo recording and interpretation is indicated for you make sure that the equipment, technician and physician reader involved in your case are up to the task. Are SSM and HealthFair Cardiovascular Screenings Promoting Wellness or Unwellness? My patients and I continue to receive mailings from SSM Health Care (here in St. Louis), informing us that they have “partnered with HealthFair to deliver ultrasound tests of the heart and arteries” in our neighborhood. If you are considering getting these, I recommend reading my previous post on them (Shoddy Cardiovascular Screenings are more likely to cause harm than good). Also, I recommend this summary (which points out in well-referenced detail that these are not recommended by major preventive organizations) from a blogger who writes eloquently on the lack of benefit of wellness programs. HealthFair’s financial model involves partnering with hospitals like SSM to promote these unnecessary screenings performed in mobile vans that travel to settings like Walgreen’s out in the community. The hospital system pays HealthFair (typically an “undisclosed amount”) to put the SSM name on their promotional flyers. SSM does not provide any review of the quality of the studies performed. SSM benefits by having its “brand” spread around and when abnormalities are detected on the exams, these patients are then provided with the names of SSM physicians. Both SSM and HealthFair benefit in this relationship by identifying as many abnormalities as possible. It doesn’t really matter to either if the abnormalities detected are real or important. The bottom line is getting more patients into the SSM system, getting down stream referrals and testing and adding to the SSM bottom line. In my previous post I warned in particular of the dangers of getting a screening echocardiogram, a test which I have spent my professional lifetime studying, writing on, teaching and interpreting. I’ve also discussed in detail how easy it is to botch an echocardiogram and what to look for to guarantee that you are getting an accurate study. Let me provide another example of how a poorly performed and/or interpreted echocardiogram can lead to a lifetime of unnecessary anxiety and inappropriate testing. I saw a patient in my office recently who was changing cardiologists because of dissatisfaction with communication. Reviewing records from the prior cardiologists, I saw that an echocardiogram was performed in 2012 and read as showing enlargement of the aortic root and pulmonary hypertension. A greatly enlarged aorta or aortic aneurysm can rupture or tear resulting in sudden death. It’s a very serious condition, consequently once enlargement of the aorta is identified, we counsel patients on appropriate activities, screening of relatives, and follow them lifelong with tests to monitor the size of the aorta. I reviewed the echocardiogram which was performed in the cardiologists’ office and it was clear that an older echocardiographic technique called M-mode had been utilized, and that the measurement was invalid. When I repeated the echocardiogram in my hospital’s echocardiography laboratory, it was normal (we have a very rigorous quality assurance program and review on a regular basis with the sonographers and physicians best practice for recording and measuring the aorta by two-dimensional recordings). Pulmonary hypertension (elevation of the pressures on the right side of the heart) can also be a sign of very severe and life threatening cardiac or pulmonary problems. If diagnosed, it typically requires extensive testing with associated risks. Like aortic root enlargement, it must be followed carefully, lifelong. Pulmonary hypertension can be measured reasonably accurately by a well done echocardiogram utilizing a combination of Doppler flow measurements and imaging of the inferior vena cava. Because of the critical importance of getting these measurements right, I have devoted numerous educational conferences to reviewing them with our sonographers and reading physicians. In the case of my patient (and I presume, numerous patients undergoing less rigorously performed screening echocardiograms) the initial echocardiogram did not truly show pulmonary hypertension and the echocardiogram I did confirmed this. Ultimately, these types of screenings done in the name of promoting wellness, are being done for money. HealthFair is strictly in it for profit; they want to get as many patients as possible paying for these screenings. Their bottom line is not enhanced by spending time and money on guaranteeing that good equipment, trained sonographers and experienced physician readers are involved. SSM is only interested in getting more patients funneled into their system. They are paying HealthFair to identify abnormalities and therefore, abnormalities will be found. SSM in this relationship is going against good medical practice and recommendations of national medical organizations in order to make money. A program that on the surface is promoting wellness, therefore, in the final analysis may be promoting unwellness. If you have had one of these echocardiographic screenings and had an abnormality detected, I would be happy to review the initial recordings and provide my opinion on their accuracy. I would do this gratis as the skeptical cardiologist in the interest of research and knowledge, not to accumulate patients or revenue.